Today is the first day of the Papertrey Ink Anniversary festivities. The challenge this morning is to be inspired by the Papertrey DT's favorite projects. Well, how do you pick just one? It seems a no brainer to think I'd be inspired by Maile's favorite, amazingly though, I chose a card by Melissa Phillips. I love her vintage-y, shabby chic style, something that doesn't come easily for me. I never seem to know what to do with this stamp set and her project simply oozed with creativity & class. I tried to add my own touches and not straight out CASE her. This was definitely a fun card to make. I didn't feel like the images needed to be perfect, the uneven stamping of some of the elements adds to the charm of the intended style. 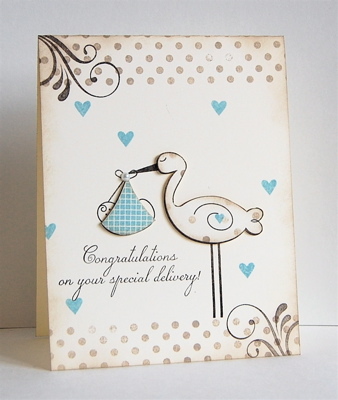 A beautiful vintage, baby card. Love your card! It's delightful. Great little flourishes to finish it off! This is a perfect take on Melissa's card. I love it. Great vintage card. I don't do well with vintage and yet I love it. This one will be a keeper for the baby's parents, that's for sure. I love how you did this. THIS will be a great card in my inspiration file for those "new additions" cards! Beautiful job and I love your blue hearts!! Wow..I love this. The colors are great and the polka dots..perfect touch. Oh, this card is soooo pretty!! I love the distressed look of the dots and the flourishes in the corners are absolutely perfect!!! Very, very, very nice!!! This is gorgeous! I make a lot of baby cards and this one beats them all! This is a gorgeous card - like you, I am not very good at vintage but you rocked it! What a sweet card! Beautiful soft colors and design! Absolutely beautiful! You and Melissa have convinced me I need this set. This is absolutely beautiful. Who on earth wouldn't want to own this? !